Welcome to Flow Kite School Sicily where you will find the huge shallow and flat water lagoon Lo Stagnone, an unspoiled nature reserve perfect to learn and enjoy kiteboarding. Taking kitesurfing lessons in Lo Stagnone is a great experience because of the perfect kite conditions, the latest material from North Kiteboarding, as well as professional, friendly, and certified kite instructors. 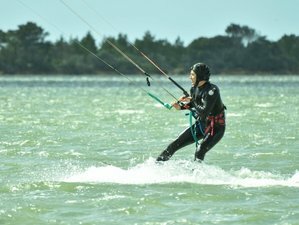 Enjoy this kitesurfing camp that fits your needs as a beginner! You can choose an accommodation between Flow Kite Apartment and Flow Kite Maxi Apartmen. The properties are located only 50 meters to the “kite beach” in Lo Stagnone (Birgi Vecchi) and 500 meters from Flow KiteSchool Sicily. Trapani is 15 kilometers away from both accommodations. The nearest airport is Vincenzo Florio Airport Trapani-Birgi (TPS), also known as Trapani Airport, only four kilometers from the property. Choose the Flow Kite Apartment with a very large master room, fully equipped kitchen, bathroom with shower, Wi-Fi, air conditioning, and a veranda for private use. Private parking is available on site with a nice garden and barbecue. This apartment is ideal for two persons but an additional extra bed can be added for a third person or a kid. The Flow Kite Maxi Apartment has two very big double bedrooms, a fully equipped kitchen, Wi-Fi, air conditioning, and a bathroom. The garden is just next to your veranda with the private parking and barbecue. This option is appropriate for four people and also for bigger companies up to eight friends. This five-day kitesurfing is going to give you all the skills and knowledge to get up on the board. On the first day, you will learn how the kite flies, the wind directions, and wind window. After you learn the setup and safety systems, you will learn how to control the kite in the water. Find the way on how to launch, re-launch, land, and keep the kite stable and then the exciting part is that when you really feel the power of the wind, body dragging. This exercise will allow you to recover your board or drag yourself back to the beach if an emergency occurs. The next step is to learn the water-start, learn how to stand up on the board, and start riding. Lessons can be done in English, German, French, Russian, Hungarian, and Bulgarian. Lo Stagnone Lagoon is a part of the largest island in the Mediterranean Sea, Sicily. This gorgeous island continues to seduce travelers not only with its amazing diversity of landscapes and cultural treasures (other activities) but lately, Lo Stagnone Lagoon became one of the most popular kite destinations in Europe. The spot is a kitesurfing heaven and only 10 minutes' drive from Vincenzo Florio Airport Trapani-Birgi (TPS) in Trapani and one hour from Falcone-Borsellino Airport (PMO). Flow KiteSchool Sicily offers kiteboarding programs which will allow them to share the joy that kiteboarding can give.